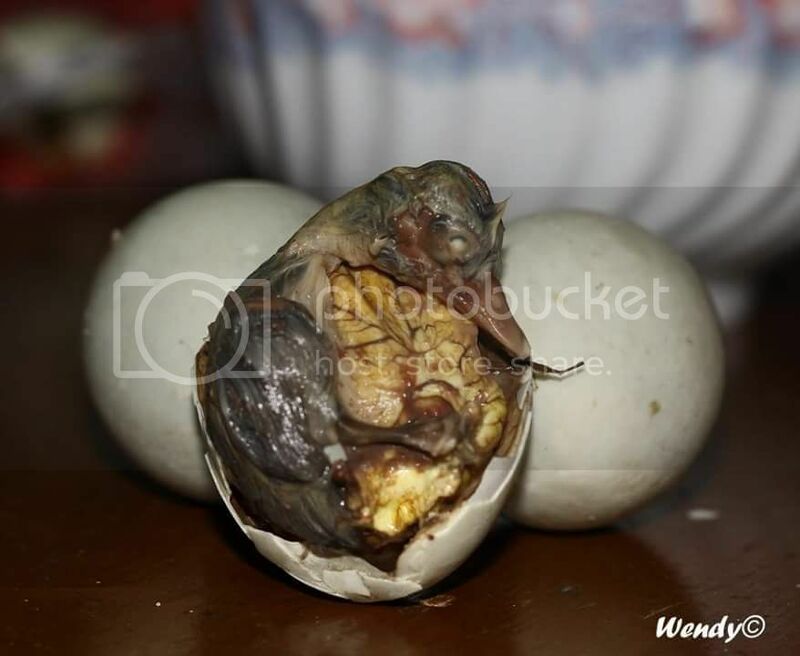 One of the exotic food featured in “Survivor” was the Philippine’s “balut” or “balot“. It is a fertilized duck egg with a nearly-developed embryo inside. It may seem one of the most exotic (read: gross) food there is for foreigners but for my children, it is a normal “delicacy” when we go home. It is one of the family’s favorite, especially on my husband’s side of the family. I still remember passing by Bulacan each time we went home to Cabanatuan before we started using the convenience offered by the North Luzon Expressway (NLex) and the Subic-Clark-Tarlac Expressway (SCTex). We never failed to stop and enjoy this “treat”. We would eat as many as we can and tease who has gotten renewed energy. It is also known to be an aphrodisiac (wink). Dip it in vinegar and salt and… YUM! “Balut” is available everywhere in the Philippines. Go call that “Balut” vendor the next time you see or hear one. You’ll never miss the “baluuuuuuuut” call especially when dusk begins to fall. And then, let’s exchange stories over “balut” and a bottle of San Miguel beer, maybe? LOL I’m dying at the comments being posted. Obvs I’ve been eating this ever since I was a child and its funny that I only started to get grossed out by it after my American peers who rebuke it in disgust but I honestly love the taste and the sabaw inside (that might be Ilocano but the broth is what I’m talking about!) It honestly just tastes like a gamier version of a hard-boiled egg and man, with salt and vinegar, I could literally eat a whole batch of this! Its sad that Filipino food gets its moment in the sun with just this fear factor kind of meal even though it has such a varied range. We use “sabaw” in Hiligaynon (spoken by Ilonggo peeps), too. Your comment is sunshine, lol! Thanks. I should make up for our Filipino dishes next time and post yummy and pleasant to the eyes dishes. Some of my friends have tried this and they’ve had mixed reviews. While it’s certainly quite different for those of us who haven’t seen it, it’s definitely cool to see another culture’s cuisine like this! I don’t think I could try it, but that’s because I don’t like the taste of meat. Thanks for sharing! Wow. That looks gross. I have not been to the Philippines yet. The most exotic thing I’ve ever eaten was a tarantula in Cambodia. It wasn’t too bad, but I wouldn’t eat it again. I definitely couldn’t eat it! Is that the way that it’s served or does it look different when it’s been prepared for eating? It’s funny how what’s disgusts one person could be another persons favourite food! I’m from Scotland and when I tell my students in Korea about our national dish, haggis, they are so freaked out! I love haggis but get freaked out by some of the things they love like chickens feet and live octopus! Thanks for sharing this though, I’m definitely going to read into it more! Hi Nicole, it’s served like an ordinary egg… boiled egg. you have to be the one to take out the shells. We don’t usually examine how the embryo looks like when we eat it:-)… I just carefully took out the shells for photo purposes. yuk! I’m adventurous, but this is a whole other story. Do you suggest closing eyes and holding one’s nose for this? Hi Shirgie, I know hahaha… we don’t really look at the embryo when we eat, right? We just take out the shells and gobble it up. This was the first time I really took a closer look at this one. Every country has their own exotic food, one more extreme than the other. It’s what you grow up with, I guess. I couldn’t eat this even if I was given a million dollars, but I’m happy your family is enjoying it. Ugh, I think I lost my appetite looking at that photo! Haha seeing as this isn’t a food I didn’t grow up with I find it really hard for me to eat something that looks like that, especially already after knowing what it is! I wish I could get the courage to try it, but I don’t see that happening anytime soon! Thanks for sharing though! It’s fun to learn about strange and unique foods around the world, even if they look REALLY scary like this one! OMG. That is interesting and exotic but I don’t think I could eat that! There’s a soup they make at school with a super veiny organ and I just can’t bring myself to eat it. Of course if I was used to eating it and seeing it, it wouldn’t be a big deal. Thanks for sharing some interesting food! My wife’s Vietnamese and she likes it but everytime I know her family is having it, I walk away from the table. I heard its good but I just can’t bring myself to try it.